I'm completely aware that this outfit would have been way better without the black 200 denier tights but, know what, I live in Scotland and it's blinking' cold! And sadly I'm one of those bloggers who actually photographs actual outfits that they actually wear outside. Like for real, I didn't just take some photographs then change. Funny concept that - personal style blogs that actually reflect personal style? OK, so maybe I'm in a bit of a ranting mood but when it's January and you see people putting up 'outfit posts' that involve bare legs, stilettos and a denim jacket it starts to grind on me. In the interests of full disclosure I wore this with a coat once I actually went outside and the reason these pictures weren't taken outside on location is because I wanted to show you the beautiful embellished pieces and there was no way I was taking that coat off once I was outside - not even for ten minutes of outfit pictures! 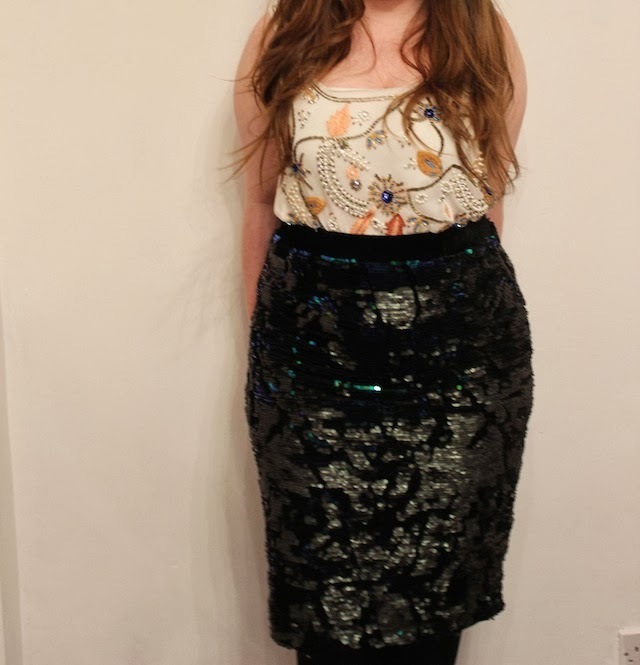 Anyway, in terms of the outfit the top is old but the skirt, which I bought before Christmas for full price, is now on sale (grimacing as I type this obviously!) and whilst I can't find it on the website it may be lingering around in your local store. The clutch was a Christmas gift (so strange to be talking about Christmas in January, non?) and again I can't find it online so it may still be in stores but I'm not sure if it would be full price or on sale. 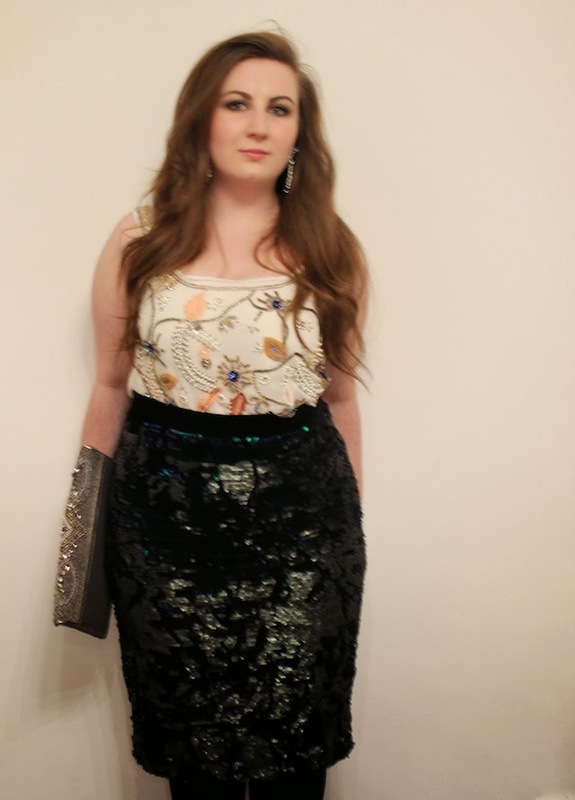 Obviously there was still something missing from this outfit - it just didn't have quite enough glittery bits going on - so I dug out some large glitzy earrings that I picked up when the Anna Della Russo collection for H&M was in stores just to add that extra bit of flash. I'm basically cheating a bit here and being a bit of an outfit repeater as this is pretty much exactly what I wore on Christmas day (so much Christmas in this post!) but since Christmas (there it is again!) was spent with my family and I didn't take outfit pictures and I wore this out to the theatre last night then no one was around to be an outfit rememberer. Which is so much worse. 10 points to your Hogwarts house if you get the reference. ah this top is fabulous! And your hair looks unreal on these photos. Such a babe! Want to know when there's new content? 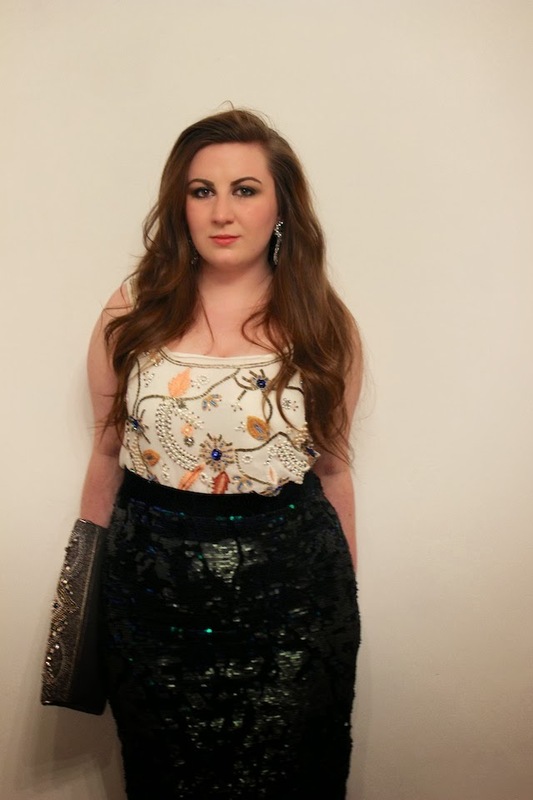 © Rose Keats - A Scottish/UK Fashion & Lifestyle Blog By Roisin E. Keats. Design by FCD.